Incorporating both theoretical and practical components, this program provides students with the opportunity to develop global citizenship skills through volunteer work. It is designed for students interested in community development and health sciences. Ongoing mentoring supports students as they develop an understanding of current issues impacting community life in South Africa. In addition to serving as a port city and important center for the South African motor industry, Port Elizabeth has retained a laid-back attitude that has given it the nickname "the Friendly City." A great number of tourists from within South Africa as well as Europe and the United States make their way to this beautiful city every year, taking advantage of its beach front location, sunshine, numerous attractions, and traditional South African food and wine. Explore first-hand Port Elizabeth's unique culture through its ethnic diversity derived from its long history of European settlements and immigration from India, Malaysia and many other foreign nations. The city is also a gateway into South Africa's unrivaled biodiversity. 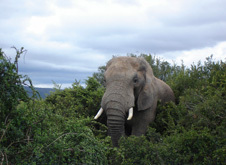 Port Elizabeth makes an ideal starting point for those of you who want to explore other nearby attractions such as the famous Garden Route, national parks such as the Tsitsikamma National Park or one of the many game reserves boasting the Big Five of South Africa, elephants, buffaloes, lions, leopards, and rhinos.